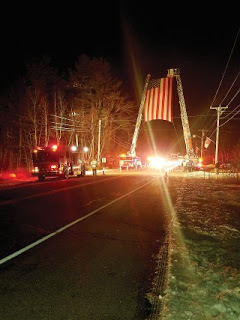 It was an amazing sight on Sunday evening, December 10, as the Wreaths Across America (WAA) convoy made their special visit in Windham. I greeted the caravan at the rotary as police and emergency vehicles from various communities across the state escorted caravan down Route 202 and onto the high school campus. It was there that the procession was welcomed by over 500 individuals waving and saluting the volunteers and Gold Star families. I think it is safe to say that everyone present was deeply inspired by such a scene. The ceremonies, hosted at the high school, included the placement of a wreath at the Veterans Memorial as well as a performance of Taps by two high school students. These events were just as moving. To honor those who have passed and served our Country in such a way created a sense of unity among all present. As a result, I was baffled by a conversation I had recently with a friend. She wondered why so much time and money are spent on wreaths instead of helping the veterans who are still with us. “I personally think we need to be putting more into helping vets who are alive,” she said. She further explained her concern for veterans who are homeless and need food as well as medical and therapeutic support. I didn’t know how to respond to her because, I suppose, there might be a bit of truth to that statement. But then I recalled another conversation. Last year, I interviewed a few members of the caravan after they returned from Arlington and made a stop at Chutes for breakfast. During the interview I sat and spoke with a Korean War Veteran as we both enjoyed our eggs and bacon. During our conversation, tears welled in his eyes. So, for others who might wonder, laying wreaths at veterans’ graves provides the opportunity to not only fulfill the WAA mission to: “Remember, Honor and Teach” but it also provides a form of healing to the veterans who are living. They need to know that following their life’s mission to protect their Country – was and is not in vain. We all prefer peace over war, so it takes bravery to follow such a calling. It is for this reason I bow before them - and place a wreath to honor the living veterans.